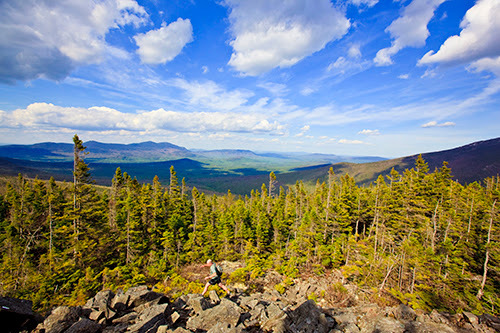 Appalachian Mountain Club News: 12,000 Acres Permanently Protected in Maine! 12,000 Acres Permanently Protected in Maine! Great news! Thanks to the joint efforts of the Maine Division of Parks and Public Lands, the Trust for Public Land, Plum Creek Timber Company, and the Maine Appalachian Trail Land Trust, 12,000 acres of land in Western Maine have been permanently protected! The Crocker Mountain Conservation Project includes three of Maine’s highest mountains, a 10-mile section of the Appalachian Trail, and a 4,000-acre ecological reserve! The project received federal funding from the Federal Forest Legacy program and state funding from the Land for Maine’s Future program. It serves as an excellent example of these programs’ success in keeping forested land forested and available for recreation. Read more about the project and the recent celebration highlighting its success here!